Links to this page can be found in Book 8, Day 2 and Rione Monti. This view shows two buildings associated with the Borghese family; in the background Cappella Paolina, the large chapel built by Pope Paul V Borghese on the southern side of S. Maria Maggiore and in the foreground S. Maria Annunziata, the nunnery founded in 1676 by Camilla Orsini Borghese, widow of Prince Marcantonio II, nephew of the pope. The plate shows also the back of Monastero delle Religiose Filippine, another nunnery. The image used as background for this page shows a detail of the windows of S. Maria Annunziata; they had screens to prevent the nuns from seeing/being seen by the people in the street. These kind of windows are still in use in some historical prisons (e.g. at Regina Coeli). The view is taken from the green dot in the 1748 map below. In the description below the plate Vasi made reference to: 1) S. Maria Annunziata delle Religiose Turchine; 2) Rear side of Monastero delle Filippine; 3) S. Maria Maggiore. 2) and 3) are shown in other pages. 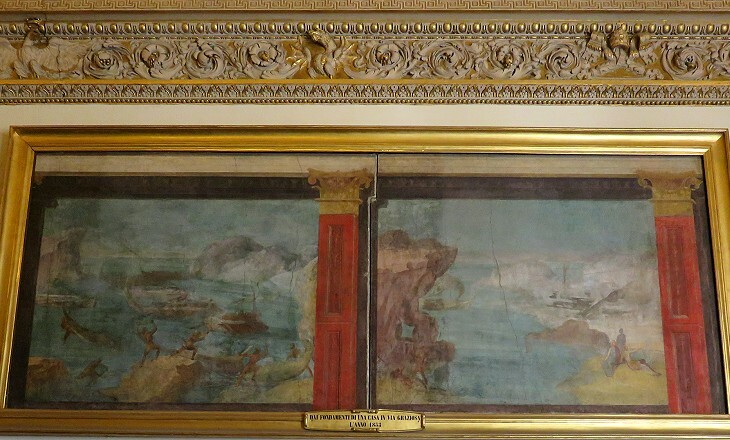 The small map shows also 4) Palazzo Imperiali Borromeo; 5) Via Graziosa. In 1872 the nunnery was confiscated and turned into a property of the Italian Army; it still houses offices of the Army or associations of members of its various corps; some XVIIIth century houses near S. Maria Annunziata have been replaced by modern buildings and the street between the two nunneries is always full of parked cars. In order to distinguish this nunnery from that by the same name near Arco dei Pantani Giuseppe Vasi made reference to turchino, the deep blue turquoise colour of the nuns' cloak. 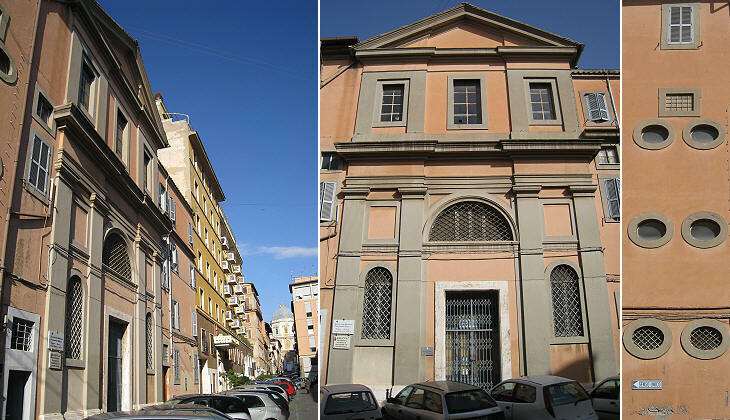 The Order of the Most Holy Annunciation, known as the "Blue Nuns", was founded in 1604 by Blessed Maria Vittoria de Fornari Strata, a Genoese widow (you may wish to see the website of these nuns who now live in modern premises in the outskirts of Rome - external link - it opens in another window). Pope Paul V commissioned Flaminio Ponzio the construction of a chapel identical to that built by Pope Sixtus V on the northern side of S. Maria Maggiore; the ancient church had the shape of a Roman basilica: a large rectangular hall divided by columns into three naves; the addition of the two chapels on the sides of the hall formed a sort of transept giving to the complex the approximate shape of a Latin cross, which during the Counter-Reformation was regarded as the most appropriate design for a church. The religious purpose of the chapel was to house a much venerated image of the Virgin Mary. 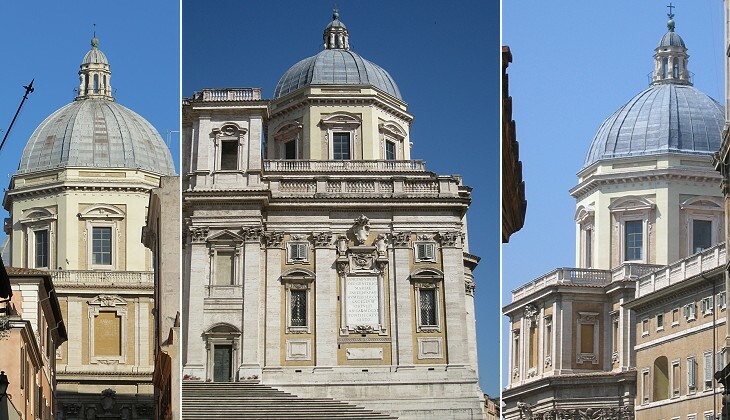 This was done by erecting one of the most impressive main altars of Rome. For the choice of ancient marbles which were used for its decoration you may wish to see a page on the Stones of Rome. 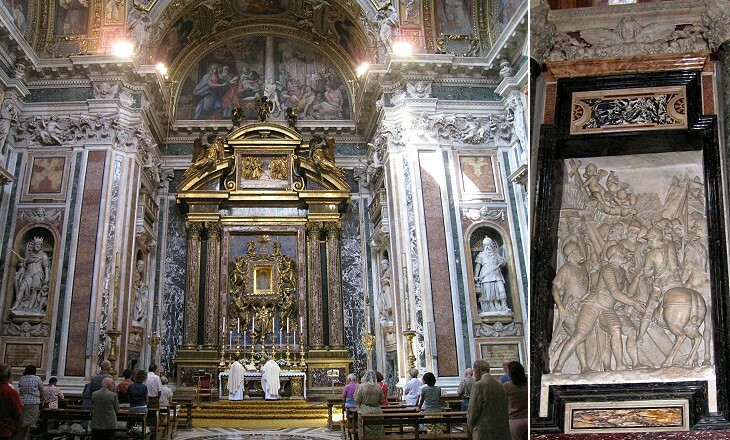 Similar to what had occurred in the other chapel, Pope Paul V decided to place his funerary monument and that of Pope Clement VIII along the two side walls of the chapel. They are shown in a page dealing with the Tombs of the Popes. The monuments were decorated with reliefs portraying events of their pontificates. La Guerra col Turco, the fight against the Ottoman expansion in Europe and in the Mediterranean Sea was not the only worry for the Popes of the first half of the XVIIth century and perhaps not the main one. 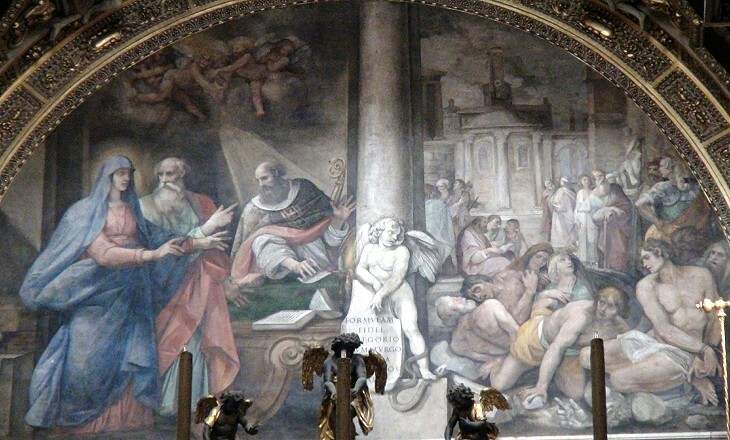 The fresco by Cavalier d'Arpino, at the time the best paid painter in Rome, is divided into two sections and that on the right shows a group of desperate people who were bitten by the venomous snake of Heresy which is stamped out by an angel. Pope Paul V supported the efforts by the Habsburg Holy Roman Emperors to impose religious uniformity by force on their domains which eventually led to the Thirty Years' War. The subjects of the many paintings, statues and reliefs housed in Cappella Paolina followed the Counter-Reformation guidelines which allowed the use of works of art in churches as long as they were aimed at helping the understanding of Christian concepts by illustrating historical or biblical events. 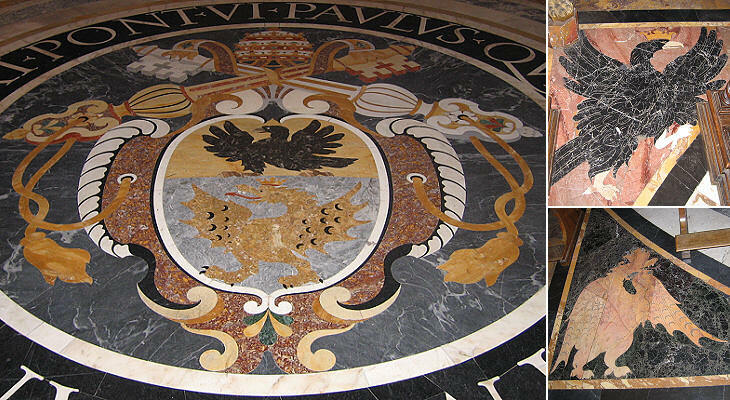 Pope Paul V however completed the lavish decoration of the chapel with many references to himself and his family. 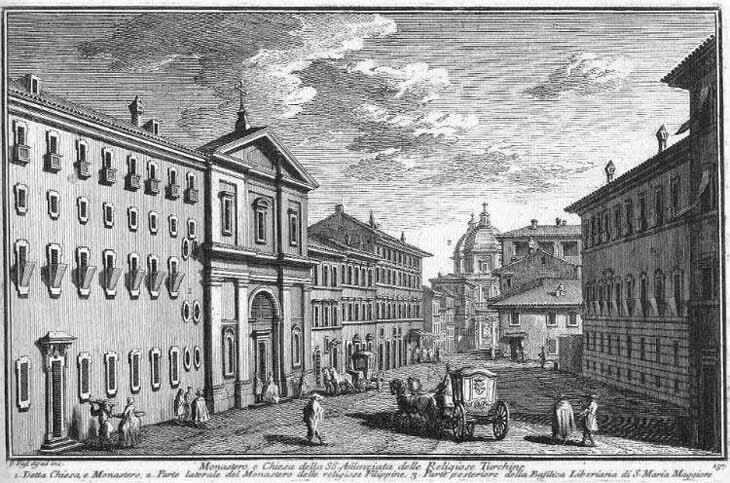 Most of the buildings around S. Maria Maggiore were erected in the late XIXth century. Two old palaces on the southern side of the basilica survived, although their appearance was modified in 1873 when the street level was lowered. 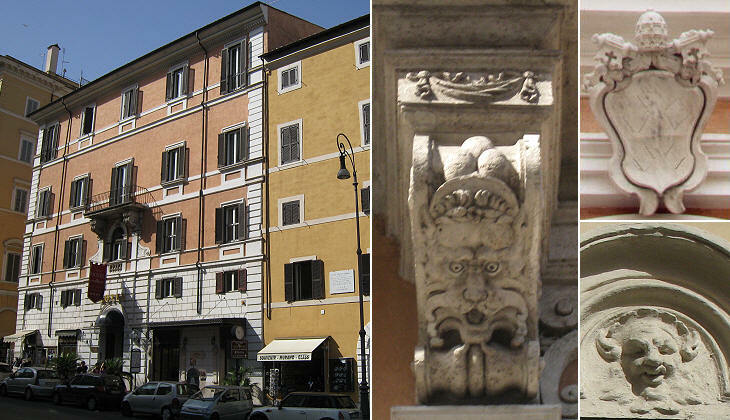 One of them was the house of Gian Lorenzo Bernini for more than twenty years (he then moved to Via della Mercede, near Palazzo di Propaganda Fide), the other one is known as Palazzo Imperiali Borromeo and it was built in the late XVIth century; it belonged to the Rospigliosi, the family of Pope Clement IX; in the XVIIIth century it was acquired by the Imperiali, an important Genoese family, who used it for housing religious institutions, one of which was founded by Cardinal Vitaliano Borromeo. The building is now a hotel with a website providing some more information on its history (external link). In 1848-849 excavations for the construction of new buildings in Via Graziosa, a street which ran to the west of Monastero delle Turchine led to finding evidence of a Roman house. 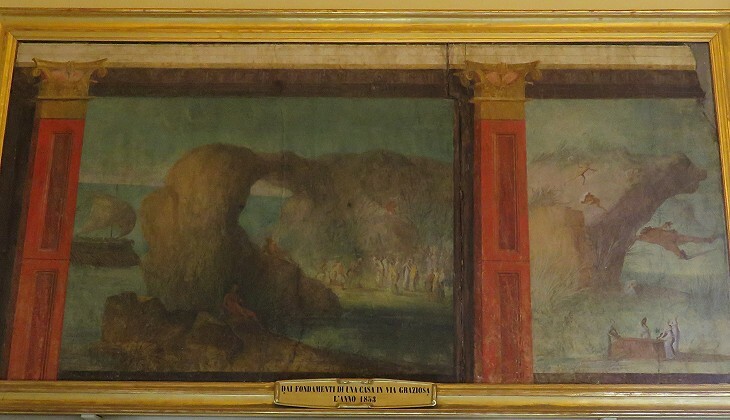 It was not preserved, but a series of frescoes which decorated it were donated to Pope Pius IX in 1853. They depict scenes from the Odyssey which are framed by an elegant architectural perspective. They were treated as oil paintings and were placed in gilded frames. Eventually Via Graziosa was greatly enlarged and modified. Today it is named after Camillo Benso Conte di Cavour, one of the Fathers of the Italian Unity, and it links the area of the Fora near Torre dei Conti with Stazione Termini. (The ancients) decorated with varied landscapes, the representations of particular spots. In these they also painted ports, promontories, the coasts of the sea, rivers, fountains, straits, groves, mountains, cattle, shepherds, and sometimes figures representing gods, and stories, such as the Trojan battles, or the wanderings of Ulysses over different countries, and other subjects, founded on real history. The passage by Vitruvius makes one wonder whether he had actually seen the frescoes of Via Graziosa. He lived in the Ist century BC so the hypothesis cannot be ruled out. The use of stories as a pretext for painting landscapes did not end with the Ancient World. In the XVIIth century it was utilized to circumvent the Counter-Reformation guidelines on works of art (e.g. the frescoes by Gaspard Dughet at SS. Silvestro e Martino ai Monti). Next plate in Book 8: Monastero delle Religiose Filippine. Next step in Day 2 itinerary: Tribuna di S. Maria Maggiore. 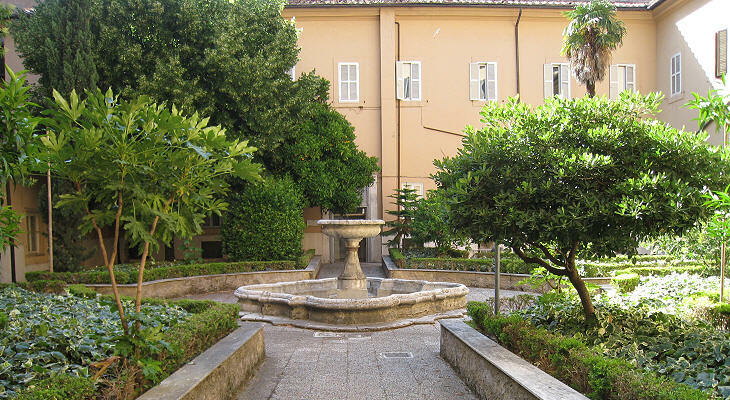 Next step in your tour of Rione Monti: Monastero delle Religiose Filippine. Circa l'anno 1675. fu eretto questo monastero, le cui religiose, per il colore, che vestono, diconsi le Turchine; la loro chiesa è dedicata alla ss. Vergine Annunziata, e li quadri, che vi sono, furono dipinti da Giuseppe Ghezzi. dirimpetto alla cappella del ss. Sagramento, evvi quella della ss. Vergine, eretta da Paolo V. con somma splendidezza. L'altare principale è ornato di maravigliosi diaspri duri, lapislazzoli, agate, ed altre pietre preziose: le basi delle colonne, i capitelli, il cornicione, il frontespizio, e i putti con altri ornamenti sono tutti di metallo dorato ed anco il gran bassorilievo, in cui viene figurato il miracolo della neve; e gli angioli, che con altri ornati reggono la ss. Immagine, furono cavati da' modelli di Cammillo Mariani, e gettati da Domenico Ferretti; le pitture sulle lunette, ed arconi doveva farli Guido Reni; ma per gl' impegni, e raccomandazioni le fece il Cav. d'Arpino, e quelle della cupola Lodovico Cigoli. La statua di Paolo V. posta nel suo deposito è del Silla, il bassorilievo a destra di Stefano Maderno, e quello a sinistra del Malvicino; la coronazione è d'Ippolito Buzio, il bassorilievo a destra è del Valsoldo, e l'altro a sinistra, di Francesco Stati, e li termini, del detto Buzio; la statua di s. Basilio, quella di Davide sono di Niccolò Cordieri, e le pitture ne' lati della finestra sopra il cornicione con quelle sull'arcone sono di Guido Reni. La statua di Clemente VIII. nel deposito incontro è del Silla, il bassorilievo a destra è del Malvicino e quello a sinistra del Mariani, finiti poi dal Mochi; la coronazione è di Pietro Bernini, e li termini a destra, del detto Bozio, e quelli a sinistra, del Valsoldo. Le pitture ai lati della finestra, e quelle sull'arcone sono di Guido Reni, fuorchè la Madonna, che fu fatta dal Lanfranco. La cappelletta di s. Carlo Borromeo fu dipinta da Baldassare della Croce, e quella di s. Francesca Romana dal Baglioni. Questa magnifica cappella ha similmente la sagrestia propria ornata di stucchi dorati, e pitture del Cav. Passignani.